We have all heard about the great competitors who raise the level of their game when it matters most. I’m not buying it. Great competitors, from May/Walsh to the USA men’s gold-medal teams to Michael Jordan, compete with a sense of urgency even when it doesn’t matter–that is a defining trait of a great competitor. In fact, that is what makes them the great champions that they are. Can you imagine Misty and Kerri slacking in the early rounds of a tournament because their best isn’t needed? I can’t. When it matters—the playoffs, match point, when you are down—there is no need for a sense of urgency because it already is urgent. In those moments great competitors are prepared to play their best because that is what they are accustomed to. They made it a habit to play with a “sense of urgency”, even when it wasn’t urgent. Now that it is urgent, it’s business as usual for them. When everything is on the line, our habits are what will take over so that we can perform our best. Performing with a sense of urgency, with great focus and calm, intensity combined with control, must be a habit that has been practiced repeatedly—not just when it’s all on the line. Why then, does it appear so obvious that the great champions elevate their game in crunch time? Because their opponents are probably crumbling under the same pressure. Most people are adversely affected by pressure—even very high level athletes, like many of the professionals we watch on TV or in the Olympics. Fewer athletes are able to perform at their highest level when the pressure is on, so they stand out at those moments and it looks like they are “going to another level” or “finding another gear”. 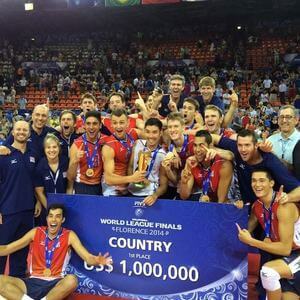 Think of Rogers and Dalhausser playing in the finals of a big tournament. It’s close and their opponents are very good, but maybe not quite as mentally tough as our boys in the red-white-and-blue. The opposing server is buckling under the weight of the pressure and the resulting serve is easier than usual. Todd and Phil are as calm as a pond and they pounce on the opportunity that is given them in the form of an easy serve. Now Rogers is serving and the guy who knows he is going to get the serve is shaking in his booties. He passes a typically good serve well enough, but is too careful not to get blocked or make an error (backing off), so Rogers makes the dig, followed by the set and the kill. Match over. Did Rogers and Dalhausser step up? In a way they did because they didn’t step back. But in reality they played the way they always do while their opponents backed off. A few weeks ago our USA Men’s Olympic team qualified for London with a convincing victory over a very good Canada team. Talk about pressure. The USA has been in every Olympic Games since 1984. People don’t realize that simply getting to the Olympics is a remarkable feat in itself, let alone making it to the podium on the day of Closing Ceremonies. There was pressure and there were nerves on both sides of the net. But our team performed well in spite of the pressure. They did what they always do. They played their game. There was nothing they did that was out of the norm. They didn’t come up with any new plays or defensive schemes. They didn’t jump any higher or try any harder. They just played their best when their best was needed. They stepped up because they didn’t back off. That level of mental toughness is rare. That’s why it is such a big advantage to have it. Here is a link to a good article that illustrates this point. Did Stefi Graf step up? Or did she simply do what she always does, while her opponent wilted in the Wimbledon sun? Some interesting stats about two of the best NBA players of all time, and one whose nickname is “Big Shot Bob” because he is known for draining it when it counts. These statistics show that Kobe and Jordan played their best all the time. They did not play any better when it mattered most, because they were already playing their best. That’s why they are great competitors—when they step on the court, it’s on. Really great article. I love especially the point that when its all on the line our real habits will shine through, so our habit needs to be urgency. Look forward to helping my teams understand this!